This recipe is the property of SheckJuarez and released under the CC Attribution-NonCommercial-NoDerivatives 4.0 license. You may not copy, derive or commercialize this recipe without following the terms of this license or the explicit permission of the creator. 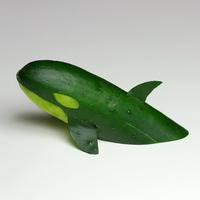 This recipe is tasty, it's a nice mellow juicy cucumber. The unnamed pods flavor though has a lot more top notes to it, almost like it delves into the realm of sour and bite. This is all earthy relaxed cucumber flesh.